Lucinda Williams already has a host of accolades to her name, including hit songwriter for her penning of “Passionate Kisses,” multiple Grammy Award winner, a founding partner in the alt-country and Americana movements in the 80’s and 90’s, and now you can add an honorary doctorate to her resume. 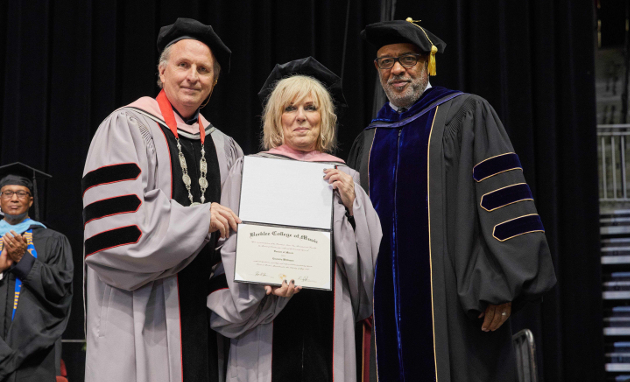 Lucinda was awarded an honorary degree from the esteemed Berklee College of Music in a ceremony on Saturday, May 13th at Boston University’s Agganis Arena. Williams received the honorary doctorate for her musical achievements and pioneering influence through her nearly four-decade career. “As someone whose life has been dedicated to writing and playing music—and the long path of continuing to try to master both crafts—being honored by an institution that helps others find their way to a life in music is the truest honor of all,” Lucinda Williams said about the distinction. Berklee College of Music is one of the most well-respected institutions in music study, and regularly gives support to artists outside the highly-commercialized mainstream, including songwriters and bluegrass instrumentalists along with a host of other disciplines. Other artists who received honorary doctorates along with Lucinda Williams include Todd Rundgren, NARAS President Neil Portnow, Korean musician/producer Shin Joong Hyun, and Lionel Richie. Previous recipients include Duke Ellington, Aretha Franklin, Dizzy Gillespie, Quincy Jones, Smokey Robinson, Loretta Lynn, Juan Luis Guerra, Annie Lennox, Paco de Lucia, Carole King, Willie Nelson, Alison Krauss, George Clinton, Rita Moreno, Julio Iglesias, Plácido Domingo, and A.R. Rahman. Lucinda Williams’ latest album is 2016’s double LP Ghosts of Highway 20 released via Thirty Tigers. It received wide critical acclaim. Good for her! Great songwriter with a Lotta talent, heart and grit. Cliche to mention but Car Wheels on a Gravel Road is a masterpiece. The song Drunken Angel is a tribute to Blaze Foley. The album also featured Steve Earle. Haven’t heard her new album yet…must check it out. Congratulations to one of my very favourite songwriters! Well deserved. Some of her lyrics would suggest a thorough examination. Dr. Lucinda, congrats and rock on!